If you live in Geneva, your closest and fastest bet to finding a doctor in any domain is les Hôpitaux Universitaires de Genève, or more commonly called, the HUG. The hospital is situated at Rue Gabrielle-Perret-Gentil 4, which is easily accessible by buses 1, 5, 7, 35 (stop Hôpital), and bus 3 (stop Claparède). Alternatively, you can also try to find a doctor with his or her own private practice around town. Whichever way you choose, you will always be required to show your insurance card upon your first visit. This is to reassure your medical provider that someone will foot the bill. When you are seeing the doctor for the first time, you will also be given a sheet to fill out, where you will leave your name, phone number, address and some basic information about you as a patient. When you are done with the visit, you can go ahead and leave the office. Expect to find your doctor’s bill via courier mail within one month, and you will be given 30 days to pay the bill from the day of invoice. You may also notice the “justificatif” sheet that accompanies your medical bill. This is the paper that you need to send to your health insurer to justify your visit. Notice that there is a time count in the bill, this means that doctors here can bill by the minutes. As they sit down and chat with you, the medical bill is ticking away like a chronometer in a taxi. So do feel free to cut to the chase with your doctor, because they love making small talks with their patients! s per the Swiss regulations (LaMal), every resident is obligated to buy health insurance. This obligation is regulated by the Swiss Health Insurance Authority, the Service d'Assurance Maladie (SAM). This regulatory body works closely with the Cantonal Population Office, l'Office Cantonal de la Population (OCP), and will communicate with any new arriving expatriate to inform their obligation of buying a health insurance within 3 months of their arrival. Note: the SAM will suggest a list of health insurance companies in its letter, but they are meant for Swiss locals. As an expatriate, you may be eligible for a cheaper health insurance solution with the same or better benefits. To have an idea of how much you should be paying, check out student health insurance if you are an international student, or international health insurance if you are an expatriate. If you think you may be eligible for an international health insurance but would like to make sure, give us a shout and we can check for you. Health care in Switzerland does not come cheap. A simple consultation usually costs anywhere from chf 75 to chf 150, depending on what your condition is. For more complex procedures, a bill can reach as high as chf 300 for immediate treatment. If you are insured with us, you can either pay the bill and claim it back using the claim form. 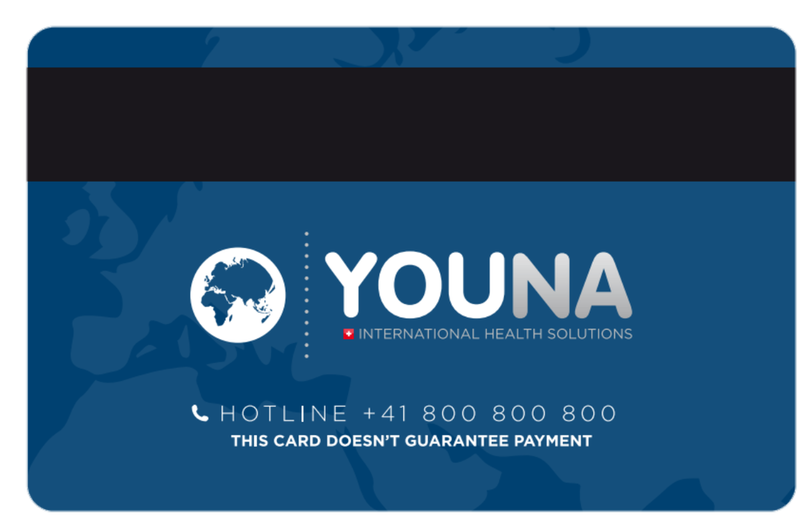 Or forget about your reimbursement and just use your YOUNA cover card.